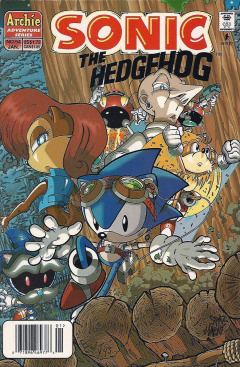 Sonic the Hedgehog 54 is the fifty-fourth issue of the Sonic the Hedgehog comic. This comic features one story: "Running to Stand Still". With Knothole Village stuck in a temporal zone three hours in the future, the citizens have abandoned the humble village. They have all sense moved to Mobotropolis, with Dr. Robotnik now defeated. There is one person, however, who refuses to abandon the village: Sonic the Hedgehog. He runs past his Uncle Chuck and Tails, who are working on a computer in one of the remaining huts of the village. They are trying to determine Sonic's maximum speed, but it's too much for the computer, causing it to explode. Sonic grabs a towel to wipe off his sweat, tossing it back to his uncle with attitude, then walking away from the two. This makes Uncle Chuck wonder why he is having issues unwinding, despite Robotnik's defeated and being away from the big city of Mobotropolis. Sonic, meanwhile, while walking away from the two, thinks back to a time when Sally gave a speech to those of Knothole after Robotnik's defeat and the reannexation of Mobotropolis. Sally was giving a speech thanking everybody for their help, and that now was a time for order. She introduced the brains that could help: Doctor Quack, Rotor and Geoffrey St. John. Lastly, she mentions Sonic, but he isn't impressed, but rather bored. He looks at his watch, and, while the crowd cheers for victory, he slams his head on the surface in front of him. Back in Knothole, Sonic is located by Uncle Chuck and Tails on a trail, fast asleep. Uncle Chuck is insistent on continuing some tests, giving a very-reserved Sonic a headset and goggle assembly. He tries to warn Sonic to be very careful with the fragile equipment, but Sonic leaves the area to the nearby desert without a thought. As Sonic runs into the desert, Uncle Chuck and Tails set up camp, knowing full-well that Sonic has a lot on his mind. As Sonic runs across the desert, his mind drifts off again to the past. Sonic recalls a conversation he was involved in between Uncle Chuck and Sally. Due to issues regarding crowding and issues between the Mobians and Robians, Uncle Chuck set forth a recommendation to house the Robians in Knothole until they can successfully live together. Sally agrees and tells him that she will notify her father of the idea. Sonic thinks it will go through quickly, but Uncle Chuck isn't as certain. Sonic heads out for a couple of minutes and returns, only to see that Sally and Uncle Chuck had already left to visit the King. He storms past Amy Rose and Tails to head to the castle. He arrives at the castle, Robotnik's old headquarters, witnessing Sally leaving the main entrance with her head hung low. She walks over to Uncle Chuck and tells him that the King declined his offer. Sonic is noticeably upset about the decision as well. Back at the Gulag, two of Geoffrey's assistants push a flatbed with the crystallized Kodos. They discuss the circumstances of his departure from the Zone of Silence, and that he was a pawn under Ixis Naugus. As they mention this, they walk by Snively's cell. He perks up when he hears about Naugus. He walks over to the cell door and continues to listen in on their conversation. On the edge of a beach, Uncle Chuck and Tails catch up to Sonic, who is resting at the ocean-side. Uncle Chuck looks at the equipment he gave Sonic, which is, yet again, destroyed due to Sonic's reckless behavior. Sonic is still obviously bothered by the events from earlier, but he decides to give the tests another go. Uncle Chuck determines another test to perform, taking out a large piece of paper, and ordering him to run across the water. Sonic backs up and then runs so fast that he skims across the ocean. Just like the other tests, he has a flashback to a few days prior. He recalls a conversation he had with Rotor. Rotor had wanted to go back to the Arctic and see if he could find his folks that he hadn't seen for some time. However, Sally had declined the mission. Knowing full-well what Uncle Chuck had went through with his request, he comforts Rotor. He decides, then, to talk to Sally. He turns around and addresses the guard protecting the room she is in, the guard allows him in. He enters the room, seeing Doctor Quack and Geoffrey trying to convince Sally that her ideas for Mobotropolis are not possible, a hospital in 2 days and armed guards on every street corner respectively. Sonic interrupts the group, trying to convince Sally that Rotor should be able to find his parents, reminding Sally of how she felt when she saw her father again. Sally understands, but says that she needs Rotor to help reorganize Mobotropolis, which is still in utter chaos. Sonic leaves the room, informing Rotor of the bad news. In the Gulag, Geoffrey's assistants lead another crystallized person, Lima Arachnis down the hall of cells. They discuss her present circumstance, and that she also worked under Naugus, again under the watchful ears of Snively. As they put Lima's body into a cell, Snively decides to take action. He looks at his thumb and presses the fingernail on it, lighting it up. Sonic's tests, meanwhile, continue as Uncle Chuck decides to try the tests in an artificial environment. He sets up a contained wooden and glass wheel on a tree for Sonic to run with. As Sonic hooks himself up to the wheel, he mentions that he thought he was already in an artificial environment, in that Uncle Chuck had lied to him about his parents' deaths. Tails' watches from aside, knowing that this won't end well. Before Uncle Chuck can respond, Sonic starts the test, running the wheel as fast as he can. Just like before, his mind also races back in time to a few hours in the past. He recalls walking through the streets of Mobotropolis, with many workers around fixing up the city. He is surprised to hear a familiar voice. He looks up to see Rosie standing in front of him, with three young Mobians playing around. Rosie is glad to see the young kids on an adventure, but Sonic is not too happy to hear that word. With Robotnik gone, Sonic feels like his shoes are tied and that he has no excitement in his life. They both sit down on a curb, as Sonic explains that it'll be difficult to rebuild the city unless each Mobian looks at their own problems ahead of time. Rosie recalls something that [[Julayla] told her: "the only difference is the one you make". These words give Sonic inspiration, so he gets up and walks off, repeating the phrase to himself, thanking Rosie in the process. Back in the present, just far enough from the Gulag that the signal from the device under Snively's thumb can reach, a group of robotic eggs in a rock formation start to crack. They eventually break, revealing Eggbots. The Eggbots have already been programmed to perform a function: locate Ixis Naugus. They fly away from the rock formation to commence their mission. Once the test on the wheel is done, Uncle Chuck, Sonic and Tails head out into the Great Forest to have a talk. While Tails flies off and chases nature, Uncle Chuck takes Sonic aside to discuss his issues. He finally decides to talk to Sonic, not about the speed tests, but about his parents. He explains that, had Sonic known that his parents were alive under Robotnik's rule, his mind wouldn't have thought clearly until his parents were saved. His emotions would've got in the way, and they likely would've lost the war. Uncle Chuck offers a hand to help him up, but Sonic gets himself up and hugs his uncle. While in the middle of the embrace, Sonic notices the wind speed drastically increasing. He looks up to see Snively's Eggbots arriving on location. At the same time, Sally contacts Sonic on his communicator, ordering him to return to the city ASAP. The title card for the next issue, 'KHAN! ', likely is based off of the same infamous line from Star Trek II: The Wrath of Khan.